Definition at line 60 of file PMaterial.h. Definition at line 56 of file PMaterial.cpp. Definition at line 59 of file PMaterial.cpp. References _group, _mat, _name, and polymorph::PUtil::materialLoaded(). Definition at line 98 of file PMaterial.cpp. Definition at line 363 of file PMaterial.cpp. References _mat, exists(), getPass(), and polymorph::PUtil::getTexture(). Definition at line 382 of file PMaterial.cpp. References _mat, exists(), and getPass(). Definition at line 194 of file PMaterial.h. Definition at line 253 of file PMaterial.cpp. Definition at line 101 of file PMaterial.cpp. References _group, _mat, _name, polymorph::PUtil::groupExists(), polymorph::PUtil::materialExists(), and polymorph::PUtil::materialLoaded(). Definition at line 129 of file PMaterial.h. Definition at line 231 of file PMaterial.cpp. Definition at line 225 of file PMaterial.h. Definition at line 264 of file PMaterial.cpp. Definition at line 459 of file PMaterial.cpp. Referenced by addTexture(), ambient(), diffuse(), emissive(), fog(), fogColor(), fogDensity(), fogDistance(), fogMode(), getTextureUnitCount(), setTexture(), and specular(). Definition at line 467 of file PMaterial.cpp. Definition at line 477 of file PMaterial.cpp. Definition at line 347 of file PMaterial.cpp. Definition at line 256 of file PMaterial.h. References addTexture(), exists(), fog(), fogDensity(), fogDistance(), fogMode(), and setTexture(). Definition at line 275 of file PMaterial.cpp. Definition at line 329 of file PMaterial.cpp. Definition at line 311 of file PMaterial.cpp. Definition at line 293 of file PMaterial.cpp. Definition at line 435 of file PMaterial.h. Definition at line 428 of file PMaterial.h. Definition at line 442 of file PMaterial.h. Definition at line 465 of file PMaterial.h. Referenced by addTexture(), ambient(), diffuse(), emissive(), fog(), fogColor(), fogDensity(), fogDistance(), fogMode(), getTextureUnit(), getTextureUnitCount(), and specular(). Definition at line 452 of file PMaterial.h. Referenced by getPass(), and getTextureUnit(). Definition at line 484 of file PMaterial.h. References _mat, getPass(), getTechnique(), getTextureUnitCount(), and print(). Definition at line 439 of file PMaterial.cpp. Referenced by exists(), and getTextureUnit(). Definition at line 164 of file PMaterial.cpp. 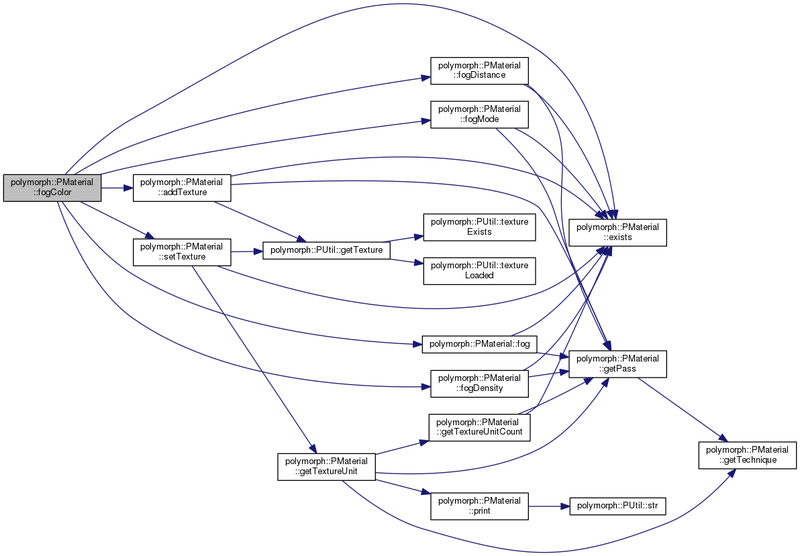 References _group, _mat, _name, and polymorph::PUtil::getMaterial(). Definition at line 190 of file PMaterial.cpp. References _group, _mat, and _name. Definition at line 486 of file PMaterial.cpp. References _group, _mat, _name, and polymorph::PUtil::str(). Definition at line 399 of file PMaterial.cpp. References _mat, exists(), polymorph::PUtil::getTexture(), and getTextureUnit(). Definition at line 420 of file PMaterial.cpp. References _mat, exists(), and getTextureUnit(). Definition at line 162 of file PMaterial.h. Definition at line 242 of file PMaterial.cpp. Definition at line 519 of file PMaterial.h. Referenced by create(), getGroup(), load(), PMaterial(), and print(). Definition at line 515 of file PMaterial.h. Referenced by addTexture(), ambient(), create(), diffuse(), emissive(), exists(), fog(), fogColor(), fogDensity(), fogDistance(), fogMode(), getMaterial(), getPass(), getTechnique(), getTextureUnit(), getTextureUnitCount(), load(), PMaterial(), print(), setTexture(), and specular(). Definition at line 523 of file PMaterial.h. Referenced by create(), getName(), load(), PMaterial(), and print().